Please note that the content of this book primarily consists of articles available from Wikipedia or other free sources online. Frank Edgar Richard Whitten (15 November 1942 12 February 2011) was a New Zealand television actor. He was more recently known for playing Ted "Grandpa" West in the New Zealand television show Outrageous Fortune. 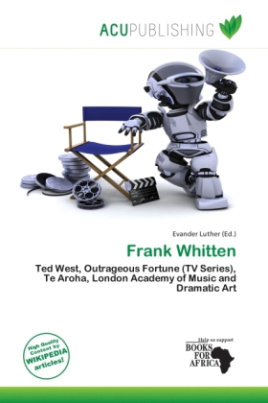 Frank Whitten was born in Te Aroha and grew up in the Waikato Region in the 1940s and 50s. Around 1963, "with very little experience and even less money", he left for England to become an actor. He also spent time as an improvisational tutor at leading British drama school the London Academy of Music and Dramatic Art, and by 1970 was the school's vice-principal. Over the next eighteen years, Whitten worked in a children's community theatre company he co-founded called Common Stock, which developed plays with, and for, working-class children.